EMA-gination: Really . . . YES! I thank God I am alive. 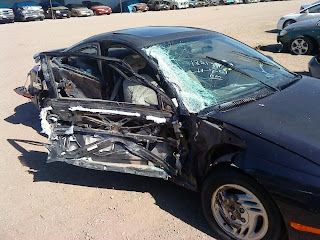 I was involved in a bad car wreck late night Friday, early Saturday morning. Broken ribs, punctured lung and stitches to my forehead was VERY sobering! Time for a lifestyle change I believe! When I feel better, I will come on here and let you know what happened! i am thankful that you are alive. will be praying that you heal quickly. Prayers for you until you are well and healthy. I am very happy you are alive, but sorry you got hurt. I pray that you will continue to heal.